Take advantage of Alibaba’s leading B2B marketplace for Global Sourcing and Salesforce’s leading cloud Platform to radically improve your Global Supply Chain. Supplier Relationship Management (SRM): Easy access to all your suppliers information from a single point (company information, contact details, product categories and items supplied, requests, quotes, orders, ERP data integration, email integration, document integration, suppliers risk data integration, LinkedIn integration, etc …). Suppliers Portal for registration and Product Items Management: Powerful Suppliers Portal to allow them self-registration of all their data and product items they can supply. Tender Planning: Define your target prices based on Alibaba products published prices and be sure you stay always on market. 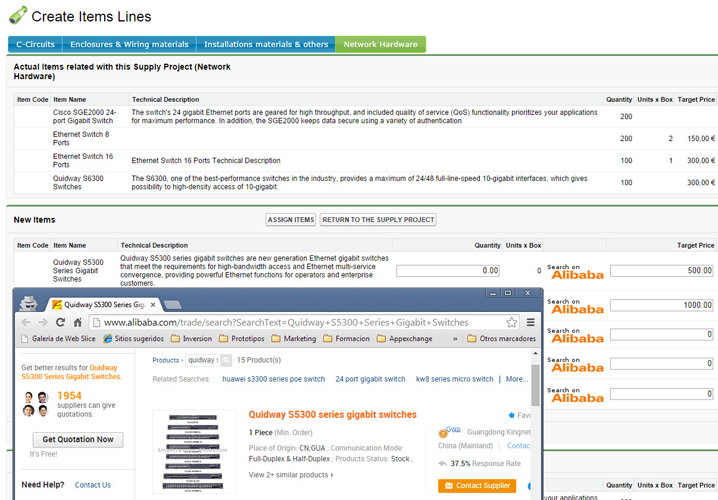 Streamline your Request for Quote (RFQ) process by sending requests directly from Alibaba: Any Supply Project in our app has a unique URL so that you can copy and paste it into any third system (specifically B2B Marketplaces, Social Networks, Emails,..) in order to request a quote from a Supplier that isn’t already registered in your system. Get your Supplier Quotes directly into your system: All Supplier Quotes will be filled directly by your Suppliers and recorded into your system. Transport & Freights rates management and Import-Export pricing quotation. This will allow you to add all your Import-Export costs to your Suppliers Quotes. Customs Brokerage: The app is already integrated with customs for more than 90 countries so that you can calculate fast and easy customs duties for all your Supplier Quotes. Comparison Tool: This tool allow you to compare Supplier Quotes from different geographical areas. Shipments: Consolidate Suppliers Orders in order to optimize your Transport Capacity, taking into account items weight, volume and packaging specifications. Track & Trace with alarm management: Take timely action when deviations occur on program. The app is already integrated with 60 Ocean Carriers for Container Events. This entry was posted in E-Business ERP and tagged Alibaba, E-Business ERP, E-Commerce CRM y ERP, E-Procurement, ERP Online, Marketplaces B2B. Bookmark the permalink. Peacock Parfumerie is an artisan fragrance jewellery household stimulated by artistry nouveau style and bohemian romance. close on their cardiovascular system in one of the stylish crystal pendants. way for setting your order with these people.